How often should ultrsounds be done when High risk? Re: How often should ultrsounds be done when High risk? My OB conducts ultrasound with every visit, every patient. Some are more in depth than others, depending on gestation and risk factors. He deals in high risk pregnancies and consults an MFM, but we've not yet needed to see the MFM in this particular pregnancy. So this is just my OB schedule. - every week from 4-6 weeks with some extra labs in between. Primarily because of recurrent miscarriage, one being ectopic, and suspected luteal phase defect. - every 2 weeks from 6-12 weeks. Miscarriage risk might have played a role here, also focusing on consistent dating because of previous IUGR. - every 3 weeks from 12-24 weeks. Most of his patients do every 4 weeks here. - every 2 weeks from 24-32 weeks. Not every week after previous pre-e gestation @ 27wks because things continued to appear perfect. However, every screen from 24 weeks on looked at blood flow, growth, and fluid levels. - then every week for the rest of the pregnancy. We're watching low-normal fluid levels now at 36 weeks, so I might go in more frequently as needed. 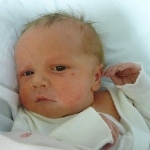 Daniel born Feb 09 at 27w5d, 1 lb 1 oz/12 inches (severe IUGR) due to Severe Pre-E & HELLP. Now tall for age and no complications. Natalie born 6-5-12 at full term, 7 lb 11 oz & 21.5 inches, progesterone 2-8 weeks (for suspected luteal phase defect), lovenox 6-29 weeks, lda 0-36 weeks, folic. We have had regular ones every two weeks, partially for my sanity because this is my first pregnancy after a stillbirth and partially to check on his growth constantly. In addition to my risk for pre-e we just found out at my anatomy scan that I have marginal cord insertion, so even if I wasn't already high risk I would start getting one every month to check growth. Last pregnancy I only had the regular ones, few and far between... when he was born he weighed 3lb 13oz at 33 weeks, but we have no idea when his growth slowed down because we weren't watching him. My sister had ultrasounds every two weeks with her twins and there were no adverse side effects. The peace of mind from checking on him so frequently is quite wonderful. Our first child, Peyton Mark, was born sleeping at 33 weeks on Oct. 25th 2011. Developed pre-e at 32 weeks. Pregnant again with what I pray is our rainbow baby, due Oct. 14th 2012. Will induce labor no later than 38 weeks if we make it that far! Thanks for the responses. I am going to call my doctor tomorrow and ask for an elective ultrasound at 16 weeks. Basically for my own piece of mind! This time, I had one at 6 wks, 11 wks, next (medical) one is 19 wks with the anatomy scan (I have an elective one scheduled to find out the gender at 15.5 weeks- I am impatient like that), and after that, they will be monthly. With DS, they were every 3-4 weeks throughout the pregnancy. By 19 weeks, our Olivia was already measuring nearly a week behind and by 23 weeks, severely growth restricted. than mess with the doppler. (Our ultrasounds are done in a separate perinatal center by sonographers on different days than appointments.) It is not uncommon on this forum if you search past threads for u/s every 3-4 weeks throughout. The doctor told me we would start monthly ultrasounds at 20 weeks. I had one (well really 2, but different doctors, same day) at 6 weeks, have one at 8 to make sure baby is growing. I'll have either one or two at 12 weeks, then 20 and monthly from there. Here's a list of the ultrasounds my doctor has done/is doing. I am currently 35 weeks 4 days. I became pregnant again within six months of delivering my daughter early due to severe PE. My blood pressure was under control at that point, but only with medication. I also developed gestational diabetes by my 28th week (I was tested earlier at 24 weeks and was negative). My doctor is extremely cautious, so she has ordered pretty much every test she can think of. My mom jokes that it's because I have good insurance that will pay for all of it, but it has really done a lot to relieve my worry about this pregnancy. Okay my question is about how often ultrasounds should be done since I am high risk. My MFM specialist doesn't want to do another ultrasound until I am 20 wks (my last was at 12 wks). I really thought she was going to do one at 16 wks but she said they wouldn't be able to tell a whole lot then. I do know with my last pregnancy at 19 wks I was already low on amniotic fluid and my daughter was already a week behind in growth. I expressed my concern over this to my doctor. All she said was that there wasn't anything that could be done interventional wise. She said as long as my blood pressure is under control then the baby should be growing okay. At 12 wks everything looked fine but I know as well as everyone else on this site does that a lot can happen in 8 wks. Any thoughts on this? How often are those of you who are pregnant again...how often are your ultrasounds being done?